As Kotaku previously reported, the movie is called Dragon Ball Z: The Resurrection of F. And that title was inspired by the best heavy metal song ever written about Frieza. No, really. Dragon Ball creator Akira Toriyama recently confirmed that, yes, "F is Frieza." In an article via Twitter user dbhJoho, Toriyama added, "When I was worrying about the story and whatnot for the next Dragon Ball movie, I heard a song called 'F' from Maximum the Hormone, and the idea came to me in a flash." Maximum the Hormone is known for its inventive—and fun—take on Japanese metal. "'F' is Frieza, and it's this dirty, cool song," continued Toriyama. "I remembered being told by the group, 'Sorry, we went ahead and sang about Frieza." The song was released in 2008 as a double-A side and hit number two on the Japanese charts. 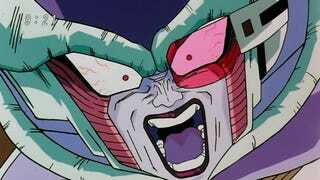 So, yes, the group has already admitted that the song is actually about Frieza—which makes the tune even cooler. And if you listen to it, yep, it's about Frieza! No wonder the song has become the character's unofficial theme of sorts. And so, Toriyama took the song's 'F' title for the upcoming anime. Let's hope he works in the tune as well.